The Prophet Elias (Elijah) was a fiery person, for his father saw angels of God around the child at his birth swaddling him with fire and feeding him with flames. 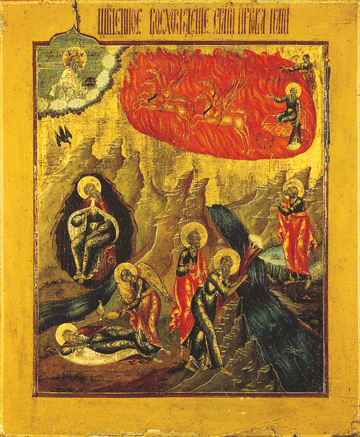 The prophet also ended his life on earth carried up to Heaven bodily in a fiery chariot as seen in this 19th century Russian icon. Several scenes from his life are depicted in this icon, for time is often simultaneous in icons. To the left, the Prophet Elias is fed by God through a raven while hiding in a cave. Below an angel is sent by God to feed and encourage the sleeping Prophet Elias to continue to Mount Horeb, where he will encounter God in a still, small voice. To the right of this he crosses the Jordan with his disciple Elisha by smiting the waters with his mantle so they could pass dry shod. On the far right, the newly ordained Prophet Elisha stands and looks up as he sees the Holy Prophet Elias being taken up into Heaven in the fiery chariot. As asked of him, Elias tosses down his mantle to empower the Prophet Elisha to be a prophet in Israel in his stead. Tradition teaches that the Prophet Elias and Enoch, who did not die natural deaths, will return and die as martyrs before Antichrist.